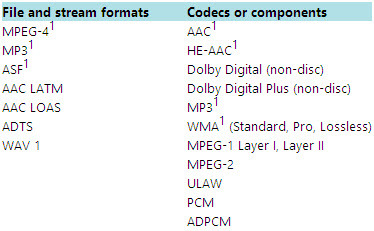 Find out which audio, video, and image file types your Surface (Surface 2, Surface Pro 2, Surface RT/Pro) can play and display. Surface comes with apps you can use to play, display, and edit many common file types. You may be able to use files in other formats by installing other apps from the Windows Store. Surface RT and Surface 2: Apps in the Windows Store will allow you to play, display, and edit more file types. Surface Pro and Surface Pro 2: Adding Windows Media Center or installing other apps and programs will allow you to play, view, and edit files in other formats. See Get started with Windows Media Center. Step 1: Tap and hold the file. (Right-click it if you’re using a mouse). Step 2: Tap or click Properties, and look next to Type of file to see what type it is and next to Opens with to see which application will open it. If you need help using File Explorer, see How to work with files and folders. Tip 1: Recommended for use with apps from the Windows Store. 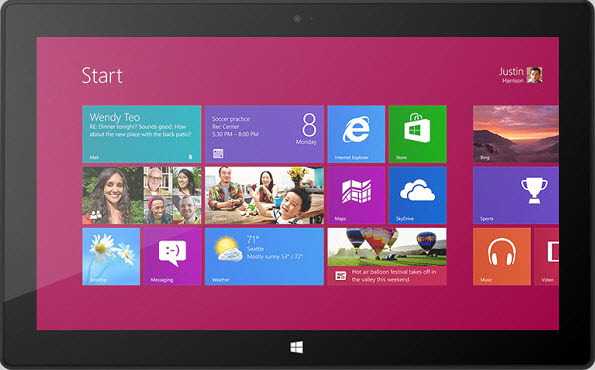 Tip 2: Requires Windows 8.1 Media Center Pack or Windows 8.1 Pro Pack. Tip 3: Recommended for use with apps from the Windows Store. The Photo app in Surface can display and edit many kinds of picture and video files. The following table shows what you can do with each type of file that the Photo app can display on Surface. Import means you can use Import Pictures and Videos to transfer the file from your camera. Fix means you can use the Photo app to edit the file. Tags mean you can add tags and other properties to the file such as ratings. You can view and edit Microsoft Office files on your Surface in formats such as those used in Word, Excel, and PowerPoint if you installed Microsoft Office on your Surface or if you have an Office 365 subscription. You can use the Reader app or install a PDF reader such as Adobe Acrobat from the Windows Store to view PDF files. Can I watch Vudu movies on Surface RT Windows 8 tablet?